How Does Classroom Design Influence Students' Learning Abilities? 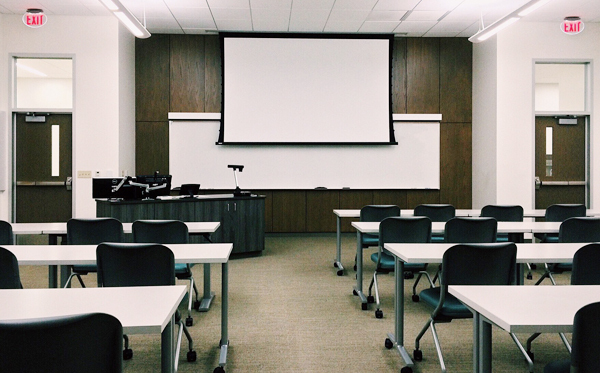 Classroom design is an important factor in facilitating a good learning environment for students, and one that helps them increase their learning abilities. Researchers at the Universities of Washington and UC Berkeley estimate that American students spend an average of “11,700 hours of their lives in a school building from kindergarten to 12th grade.” For this amount of time, students need to be comfortable in their environment so they can educationally thrive. A classroom’s layout has a much larger impact on students than you may think. According to Teacher Magazine, students are more apt to ask questions when placed in a semi-circular format over the traditional rows of desks. When deciding on the furniture’s layout, you want to think about cultivating a comfortable environment so that students are more apt to interact with one another and with the material being taught. However, traditional layouts can be stagnant, so having different options or using flexible classroom furniture can help keep students stimulated. At all times, a teacher should be able to see each child’s face in a lecture style environment. Children are constantly mobile and students need adequate lighting and a noise-free environment to thrive in a classroom. Face-to-face interaction allows students to be more active and engaged with their work. As such, a central tenet of active learning involves keeping students stimulated. To accomplish this, well-conceived classroom design keeps distractions at bay while allowing teachers to effortlessly communicate with students in order to maximize a lesson’s resonance. When students are able to sit on or interact with active, ergonomic furniture, they are more comfortable and can focus on learning. Teachers need to have enough space to reach all students, and can ask for their input in terms of classroom design to see what will make them happiest. Classroom decorations are a tricky subject for teachers. However, decorations go a long way in helping students feel like they belong. Whether they’re arts and crafts projects, dioramas, or informative posters, it can be beneficial for students to see vibrant, educational graphics in which they’ve invested time and effort. It is fairly obvious that children are not all the same size. However, in many traditional classrooms, every desk and chair is the same size. With new design and technologies advancing, there are now chairs and desks available that are adjustable based on height. Also, if students perform better in school when they are comfortable, then it’s important to not only have adjustable furniture, but pieces that can adapt to varied styles of learning. For instance, if a student does better when standing, then an adjustable sit-to-stand desk may solve problems of restlessness. Providing ergonomic furniture fosters good posture, which is ultimately beneficial for long-term health. When students slouch or sit incorrectly, it can cause pain and discomfort for them in the classroom and in their futures. In their day-to-day experiences, this type of discomfort can distract students from their studies and decrease their learning abilities. Overall, students benefit from environments that foster their physiological, emotional, and cognitive needs. When classrooms are designed to minimize distraction and discomfort, they can maximize students’ potential.